Single-acting baking powder first hit the marketplace in the mid-1850's. The Gold Rush was still rushing, and John Chisum's cattle drives were at their peak, repleat with chuck wagon and cook--always called "Cookie" regardless his origins. Sourdough was a critical supply (ref. : http://www.articlesnatch.com/Article/Contents-Of-A-Chuck-Wagon-Cooking-Supply-List/1621894 ) Baking powder isn't mentioned. Double acting baking powder, began replacing single-acting in the early 1890's, just in time for the Yukon Gold Rush. Yesterday, I dutifully fed my starters their weekly ration. I had about 200g of discard starter. The night before, I'd watched True Grit (the real one, with John Wayne) so I was in the mood for some real sourdugh biscuits. As ever, I googled recipes. Much to my disappointment the first half-a-million recipes I scanned all called for baking powder--from a tsp. to 2 Tbls. Sourdough starter seemed to be almost an afterthought.--1/4 cup to 2 cups. None of them required refreshing. Just stir the starter in, and rely on the baking powder to puff them up. In the second half-a-million recipes--ain't Google grand?--I found one recipe wherein baking powder was optional, but recommended it if you didn't want to wait. I mixed the flour, sugar, salt, and butter/lard cubes together with my hand, squeezing the fat cubes between my thumb and fingers until they were all flattened and well coated with flour. I added the sourdough starter, mixed it in, and kneaded the dough in the bowl, until it formed a ball. The dough felt a little dry, but I didn't add any additional liquid. I rested the dough, covered and chilled in the refrigerator, for 15 minutes. I turned the ball out onto an unfloured dough board, and rolled it to about 1 inch thick, folded the dough in half, and rolled it out again. I repeated this about six times. Each time I rolled it out the dough got more flexible, and felt less dry. I was glad I hadn't added additonal liquid. On the final roll-out I went to 1/2 inch thick, cut out 17, 2-1/4" biscuits, arranged them on a Silpat pad lined half-sheet pan, covered them with a dry tea towel, and returned them to the proofing box (76°F). They proofed for 2 and 1/2 hours. They had expanded, but not doubled. Baked in a 400°F oven for 14 minutes (light golden brown). They more than doubled with oven spring. Lifting the first one to the cooling rack I knew, from its light feel, I had a success. The crumb is closed, but not dense; looks like most other baking powder biscuits I've made. However, flavor-wise it is definately sourdough! I ate one cold, with nothing added this AM. Firm mouthfeel, and a lovely tang in the after taste. I think I overworked the dough a little. Next time--and there will be a next time--I'll only roll them out three or four folds. I will also up the temp to 425°F, and bake them on my baking stone. I think this is more like what Cookie baked. How much flour in the recipe ? I'll edit it right now. Thanks, Anna, for catching my senior moment. Now if I could only buy some decent lard. Leaf Lard is available here, but not all the time. I use what I can get: Armour brand, available at better supermarkets, among the shortenings, not the refrigeratied sections. Anyway, thanks a million for sharing the biscuit recipe. I've been wanting to try them, also. Hope mine turn out as good as yours! I appreciate being lulled into a story about a dead miner who died trying to protect his starter. True to the era, a regular tough guy. My success with the King Arthur sourdough pancakes/waffles recipe has me converted to using the discards in that manner. My daughter has informed me she only wants the "good pancakes" from now on. Reading your post, there may be hope for my biscuits yet. I'm infamous for my hockey pucks and chicken stew. I'll have to try this. Thanks. ...lies in managing the fat, and rolling and folding the dough. 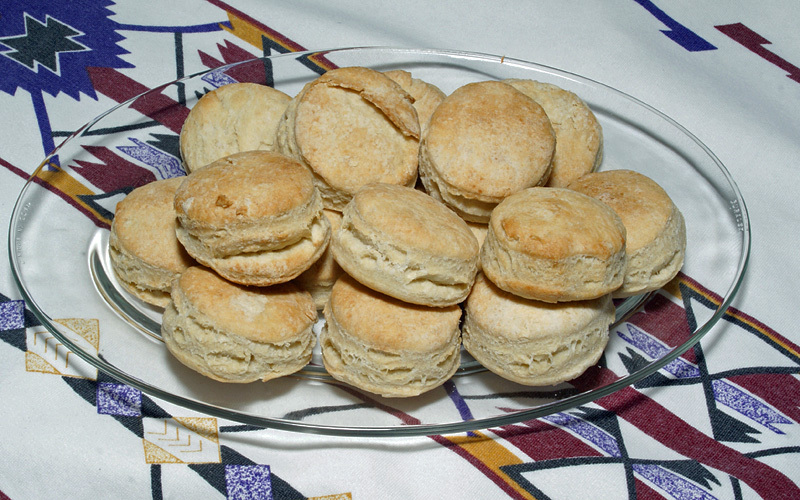 Most modern biscuit recipes call for either liquid shortening, or cutting the shortening into the flour mixture until it looks like coarse meal. Here i leave the fat in much larger chunks, but flattened. When I knead the dough in the bowl, I fold the dough over itself with light pressure only until it forms a ball. Rolling and folding the turned out dough adds to the final flakiness--kind of a lazy man's lamination. I could have proofed these longer; I know they could have expanded more. However, the hour was late, and the Netflix movie was over;-) so I baked them. I wasn't expecting hockey pucks, but I hadn't dismissed them from my mind. But those look mighty fine to me! Can we have the sequel to cold dead miner's sourdough? Please, pretty please! ...The Purloined Combo Cooker...stay tuned. If you want to check out other 'original' sourdough biscuit, doughnut, pancake and bread recipes you should get hold of a copy of The Complete Sourdough Cookbook, by Don and Myrtle Holm. It was originally published back in 1973 and was the book I cut my teeth on sourdough baking with. I've still got the dog-earned copy that used to accompany me to British Columbia every summer for a number of years when I helped a friend build a home out in the woods. You can find it on Amazon.com. my mother was Queen of baking powder biscuits and I make not to bad of ones, will definitely have to try this recipe, and you are right, they certainly didn't have BP in the old days, you might have baking soda but they wouldn't make biscuits with that. Can you find a real butcher shop and buy pork fat, then slowly render it in the oven, 200 degrees F for hours, you put the fat on a rack and just slowly cook the snot out of it, the left over browned fibre you break up and is called cracklings, they go well in biscuits or cornbread. The fat you simply pour into containers (jars actually work the best and keep in the fridge, no homoginized crud, no preservatives and way better for you than margarine, or even that store bought lard that keeps on the shelf not in the cooler in my stores. Excellent read and a recipe I'll try soon. Things go better with lard. ...there is an equal amount BY WEIGHT of flour and water. However, that's less than the whole story. What you need to learn is Bakers' Math. It's a universal tool used by most bakers, professionals and hobbyists, and by all serious bakers. With it you can communicate bread formulae unambiguosly with all serious bakers. With a bread formula, unlike a recipe, you can readily make one loaf, or a hundred loaves. It's a rapid formula evaluation tool. knowing Bakers' Math, and a bit of experience you can quickly evaluate formulae and recipes for expected texture, dough handling difficulty or special techniques required. You can find excellent explanations of Bakers' Math here on TFL--just search for "Bakers Math" (the search box is on the left hand side of all TFL pages). Also, most of the baking books you'll see refererenced here on TFL also contain excellent explanations. The Bread Baker's Apprentice (Reinhart), Bread (Hamelman) and bread baking, An Artisan's Perspective (DiMuzio) are three examples. It's not difficult to learn. Welcome to the wonderful world of serious (and fun!) baking. This is good stuff. I found the Baker's Math section and I now need to have another go at my sourdough biscuits. The ones I made were tasty but did not rise much. I think I didn't refresh my sourdough starter enough. It was sitting unused in the fridge since last summer, and I refresehed it twice. It was just bubbling with the second refresh. I know this is an old thread, but I still want to thank you for posting your recipe for sourdough only biscuits. I have been looking unsuccessfully for such a recipe myself. I don't know why I didn't just start at TFL! It contains a couple of updates on the formula. Nothing major, but small changes worth looking at. Olive Oil Bread:Australian Foccacia, or just a book review?